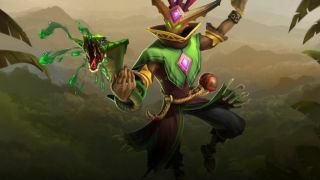 Mal'Damba is the first new character to be released since Paladins' launch, a support champion who can both heal allies and take down enemies with his rather creepy cobra companion. Wekono’s Chosen aims to slither and snake his way around the realm dishing out AoE abilities that control team fights and create openings, allowing him to wreak havoc on his foes. Mal’Damba’s weapon fires a deadly glob of venom every 0.55 seconds and deals 450 base damage to a single target. It’s definitely not the strongest weapon in the game and it can be hard to maintain accuracy with each shots drop-off, but the reload has a very interesting property. Once Mal’Damba reloads he can throw his cobra forward, stunning his enemies and granting him bonus damage (up to 550) based on how much ammo is missing. This is a great way to lock down an opponent and can be lethal when used in conjunction with the Chosen’s team. Try to prioritise landing the stun on enemy damage dealers so that your teammates can unleash a barrage of attacks that shut down the potential threat. Mal’Damba calls upon spirits to enchant an allied champion, healing 280 health every second and lasting up to five seconds. This ability is useful for flankers and champions like Drogoz and Evie who can fly around the map and easily outrange the AoE heals from Grohk and Grover. Mending Spirits allows you to heal allies from a distance and gives you opportunities to save champions that would otherwise be out of reach. If the range of Mending Spirits heal wasn’t enough, Mal’Damba can also throw a gourd full of venom that heals his allies for 200 health every second and damages enemies caught within its radius for 100 every second. This ranged AoE heal offers great crowd control potential and is very effective when both friend and foe are close together. The gourd can be bounced off walls and gives the realm’s resident witch doctor the ability to safely zone enemies while healing allies in areas that would usually prove fatal for a squishy support. Mal’Damba has a great dodging ability with Slither and can quickly dart forward becoming untargetable for the duration of the cast. This will allow him to escape various abilities and heavy hitting ultimates, especially from champions like Drogoz, Bomb King, and Skye who are very popular right now. It may not have the untargetability or range that Grohk’s Ghost Walk ability offers, but it is enough to dodge otherwise lethal attacks and ultimates. Mal’Damba’s ultimate summons a gigantic snake that fears all enemy champions for two seconds and causes them to take 20% additional damage from their foes. This a great ultimate to use for those last-minute pushes, killing tanks, and zoning enemies away from the capture point or payload. Dread Serpent gives Mal’Damba’s team a few vital seconds to kill and chase their opponents away from the objective and turn around an otherwise unwinnable team fight. Wekono’s Chosen is certainly on the squishy side with just 2500 base HP and he also lacks the mobility to get away if cornered. He doesn’t have a hook to pull him out of danger nor does he have a movement speed buff. If Mal’Damba is caught in a close quarters battle he’s going to have a bad time. His lack of escape can be troublesome, especially on smaller maps where flanking and close quarter battles are very common. Ideally, the witch doctor will want to keep his distance from enemy damage dealers and rely on his team to keep him safely out of harm’s way. You’ll want to stick close to an ally and communicate with your team so that you are not left open to the aggressive playstyles of the enemy’s team. The impact he has with Dread Serpent makes him utterly terrifying even for tanky front liners who can soak up large amounts of damage. The ability to heal his allies from afar is game changing and can really help turn the tide of a team fight. Unfortunately, the physical drop-off from his auto-attacks does make it rather difficult to unleash his full damage potential at medium to long range distances, but with the right deck you can maximise your damage output in other areas. As the majority of maps are very small—with the exception of Fish Market, Enchanted Forest, and Glacier Keep you’ll want to opt for a more defensive build. This will allow you to have the added survivability that Mal’Damba usually lacks and give you more opportunities to control key choke points and force your enemies to retreat. Mal’Damba can quickly change the momentum of a match and is able to effectively split up and cut off his enemies, making it easier for his teammates to surround and engulf their foes. This is even more effective on larger maps when it takes longer to get back to the action. Say your team manage to sweep the enemy, instead of staying back and capturing the point you could scout ahead and land your Gourd on a bunch of mounted targets. This will instantly force your foes to dismount and prolong their trek back to the objective. Mal’Damba brings something new and exciting to Paladins. Not only does he offer players a chance to tackle objectives in a new way, he also proves that there is room for more than one hero-based shooter. From its pre-release to launch, Paladins has been ridiculed for being nothing more than an ‘Overwatch clone’. The champion-based shooter has struggled to remove itself from this stigma and it’s refreshing to see how Hi-Rez’s design team are tackling this issue. Will Mal’Damba be enough evidence to prove to people that Paladins has original designs? Probably not, but for those that play and continue to enjoy the game's intricacies and deck-building, Mal’Damba is certainly a welcome addition.